SINGAPORE - Water prices will increase for the first time in 17 years, Finance Minister Heng Swee Keat said on Monday (Feb 20). 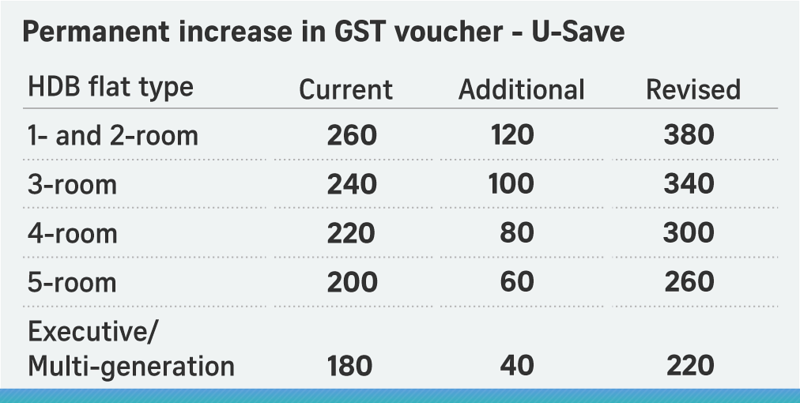 Including taxes, the prices will go up by 30 per cent in two phases. The first hike will be from July 1 this year, and the second from July 1 next year. But lower and middle income households will get help to manage the increase. "Water prices were last revised in 2000, almost 20 years ago. We need to update our water prices to reflect the latest costs of water supply," Mr Heng said in the 2017 Budget speech in Parliament. There will also be a water conservation tax of 10 per cent on Newater for business users. In addition, a sanitary appliance fee and waterborne fee will be restructured to become a single volume-based fee. Households using more water, that is above 40 cubic m, will be charged a higher rate to discourage water wastage. The increase will be less than $25 per month for three-quarters of businesses, and less than $18 for three quarters of households. But after subsidies, 75 per cent of HDB households should see an increase of less than $12 a month in their water bills. Households in one-room and two-room flats will not see any increase in their bills, Mr Heng said. They will be receiving U-Save rebates of up to $380 for the year, an increase of $120 from $260. Three-room flat households will get an increase of $100 in U-Save rebates, four-room flats an increase of $80 and five-room flats $60. Executive and multi-generational flat households will get $40 more. These increases are permanent and will cost an additional $71 million a year. About 880,000 HDB households will benefit. 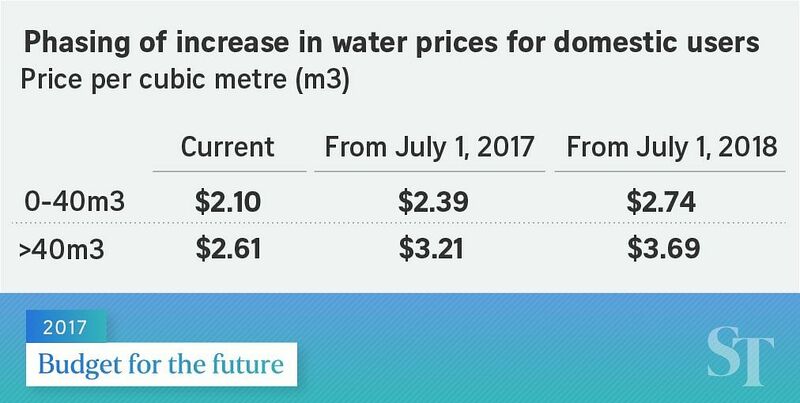 The price increase will go towards maintaining Singapore's water infrastructure, and more expensive sources of water such as desalination. With more unpredictable weather patterns, water levels at the Linggiu Reservoir in Johor have been falling. It supplies about 60 per cent of Singapore's water needs. Singapore has invested in desalination and Newater plants which are "costly but necessary" investments, Mr Heng said. The country gets water from four National Taps - Newater, water from local catchment areas, desalination and imported water. "Rising costs of resources and the use of more complex development approaches have exerted upward pressure on the costs of producing and delivering water," he wrote. The tariffs for domestic potable water, which are calculated monthly, stand at $1.17 per cubic m for the first 40 cubic m and $1.40 per cubic m thereafter, excluding taxes. This will go up to $1.19 for the first 40 cubic m and $1.46 per cubic m thereafter from July 1, 2017. Prices will be $1.21 and $1.52 respectively from July 1, 2018, excluding taxes.